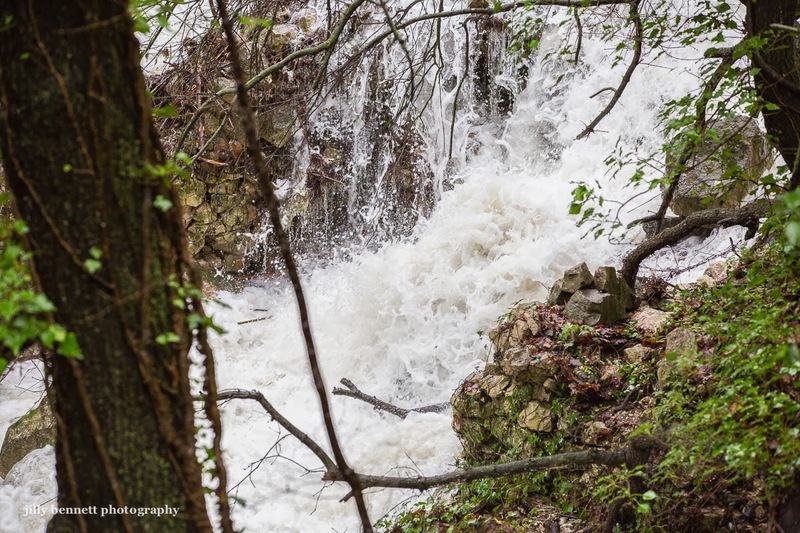 Menton Daily Photo: Water, water everywhere! 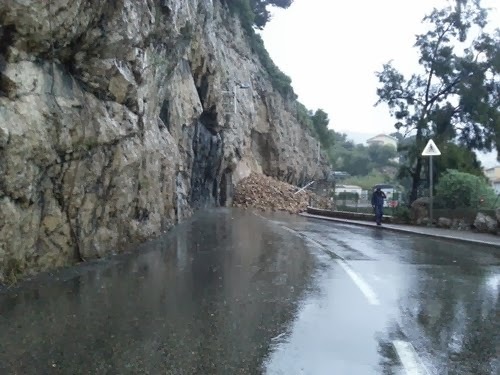 Two nights ago we had what amounted to one month's rain in a night and so yesterday, the Cote d'Azur woke to torrential rains and a lot of roads blocked by fallen rocks and in some cases, the road itself had fallen away. The Route de Gorbio (see last two photos) is likely to be closed for repairs for two months. To get to and from the village will involve a very long trip via the cemetery of Roquebrune. The first photo shows the creek below my land. This is normal a gentle creek - today, as you can see, it's a torrent. 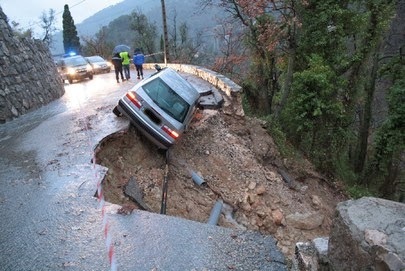 Il y a deux jours nous avons eu, en une nuit, l'équivalent d'un mois de pluie et ainsi hier , la Côte d'Azur s'est réveillée sous des pluies torrentielles, beaucoup de routes bloquées par des éboulis et dans certains cas, la route elle-même emportée. La Route de Gorbio (voir deux dernières photos) va d'être fermée pour travaux pendant plusieurs mois. Pour entrer ou sortir du village, il faudra faire un très long trajet via le cimetière de Roquebrune. La première photo montre le ruisseau en dessous de ma propriété. Normalement, c'est un gentil ruisseau - aujourd'hui, comme vous pouvez le voir, c'est un torrent! Jilly I'm glad to hear you're safe. The reports about rains in your region, particularly around Menton were quite impressive, and I understand you've got rain forecasted for the whole weekend. 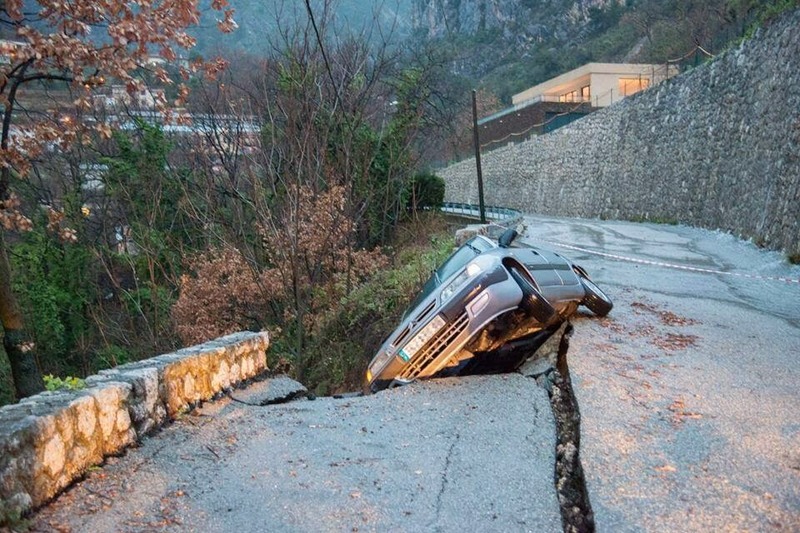 I was much impressed by the photos of the route de Gorbio published by Nice Matin - gosh what a scary scene! Oi oi oi! Nature is showing who's boss. My goodness, how absolutely terrifying that must have been for the driver - I've just read about it. Stay safe Jilly! So impressive! Glad to know you are safe Jilly! Too much weather or too little--neither is good. Wish we could share your rain, it would be just about right. Amazing first shot, and worrisome other shots! Found you through Nathalie's blog.